With a constant f/2.8 aperture throughout the zoom range and a 3-stop Image Stabiliser, the Canon EF-S 17-55mm f2.8 IS USM provides outstanding performance and framing flexibility in low light conditions. 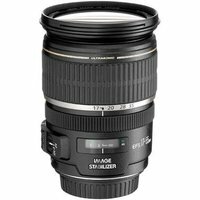 This 17-55mm f2.8 IS USM lens is for use with Canon DSLRs with a crop sensor (APS-C) such as the Canon 750D or 7D MK II, but isnt suitable for full-frame cameras such as the 5D MK III or EOS 6D. Canon EF-S 17-55mm F2.8 IS USM Lens with Hood.